A MkI type Land Rover in green with brown tin canopy. It is in extraordinarily good condition - a lovely original example of this increasingly hard to track down variant. 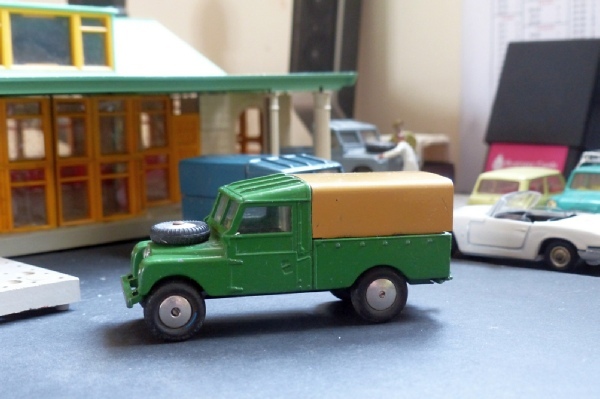 This was only available in Gift Set 2 with a horsebox and was, in fact, the only normal 406 Land Rover that came with a tin tilt / canopy. Even the canopy is unmarked and does not show the usual signs of rust or bending.The green paintwork is unmarked, even the roof ridges seem clear of rubbing marks. The tyres and wheels are all clean and original. I doubt if you’ll encounter a better example. It is also for sale with an early pony trailer in its true home as a Gift Set 2. I have a similar model in pretty good condition available individually or in a Gift Set 2.